Robert Emmanuel Pires (born 29 October 1973) is a French football coach and former professional player. Pires played for French clubs Metz and Marseille prior to his time with Arsenal, where he won two FA Cups and two Premier League titles including the club's unbeaten season of 2003–04. A former France international, Pires earned 79 caps between 1996 and 2004 for his country, including winning both the 1998 FIFA World Cup and UEFA Euro 2000. He has been included in the PFA Team of the Year for the 2001–02, 2002–03 and 2003–04 seasons, was the Player of the Tournament for the 2001 FIFA Confederations Cup, FWA Player of the Year for the 2001–02 season, Ligue 1 Young Player of the Year for the 1995–96 season, and was included in the FIFA 100 by Pelé. He was also voted by Arsenal fans as the 6th greatest player in the club's history. Pires played the majority of his career as a left winger, but could also play all across the midfield or in a position to support the forward line. Pires is currently coaching at Arsenal. Pires was born in Reims, France to a Portuguese father and Spanish mother. Pires, the elder of two boys, spent most of his childhood dressed in two football shirts that reflected his divided loyalty. One was a Benfica shirt (his father was a fan) and the other was a Real Madrid shirt. Pires confessed he had difficulty in school because his did not speak French well at the time, due to the fact his parents only spoke Spanish and Portuguese. His passion for football was inherited from his father, António, who played with Les Corpo, a local team, and every Saturday night Pires would watch him play. At the age of 15, Pires left school and began his dream of a career in football with a two-year sports degree course in Reims. At the insistence of his mother, Pires continued with Reims and eventually was called up four years later. Pires is a graduate of the FC Metz youth academy, making his senior debut in 1993 against Lyon. During his six seasons there, he scored 43 goals in 162 matches, and won the Coupe de la Ligue, prompting a £5 million move to Olympique de Marseille in 1998. At Marseille, Pires had a mixed two-year stay. His first season saw Marseille miss the French league title by a point and they also lost the 1999 UEFA Cup Final to Parma. His second season saw him suffer a spate of on- and off-field problems, which led him to boycott the club at the season's end. Pires was signed by Arsenal for £6 million in 2000, after stiff competition from Real Madrid and Juventus, replacing Marc Overmars, who had left for Barcelona for a record £25 million. Initially, Pires' form was indifferent, and some people criticised him after his comments that the English game was too physical. However, he slowly began to regain the form he had shown at Metz, scoring a superb solo goal against Lazio in the 2000–01 Champions League, and the winner against Tottenham Hotspur in the FA Cup semi-finals. However, Arsenal went on to lose the Cup final to Liverpool 2–1. By 2001–02, Pires had fully got to grips with the English game and had one of his best seasons. Pires scored superb goals against Middlesbrough and Aston Villa. Against Aston Villa, Pires chased after a long ball by Freddie Ljungberg, and lobbed the ball over the pursuing George Boateng, and finished off the move with a delightful lob over Peter Schmeichel. He led the Premier League assist charts and was voted both FWA Footballer of the Year and Arsenal's player of the season, as Arsenal won the league title. This was despite not playing the last two months of the season after suffering a cruciate ligament injury in a FA Cup match against Newcastle United. This also ruled him out of playing in the 2002 World Cup with France. After a lengthy layoff, Pires made his comeback in November 2002 as a substitute against AJ Auxerre in the UEFA Champions League. Although Pires initially found it tough, he eventually returned to form, scoring 14 Premiership goals in 20 starts that season, including a hat-trick against Southampton on the penultimate day of the season. Pires was voted the Premier League Player of the Month for February 2003. Pires capped off his season by scoring the winning goal in the FA Cup Final against Southampton. He went on to be a crucial part of Arsenal's quest for the Premier League title in the 2003–04 season, which they achieved, remaining unbeaten and becoming the first English top flight club to do so in 115 years. Pires and his Arsenal teammate Thierry Henry were instrumental in that season, scoring a combined 57 goals in all competitions. Pires made a sluggish start to the campaign, but a wonder-goal against Liverpool at Anfield kick-started his season. Pires showed football fans his sublime technique, skills and finishing, most notably with his goals against Liverpool, Bolton Wanderers, and Leeds United. He surprised a lot of people with a world class tackle on Claude Makelele and, following that, a run into the penalty box which dragged William Gallas and John Terry away, thus making space for Patrick Vieira to have a one-on-one with the Chelsea goalkeeper and subsequently scoring. Arsenal won that match 2–1, with Vieira's goal the equaliser. That day of Premier League action proved decisive, as Manchester United's failure to beat Leeds United during the same day resulted in Arsenal getting a huge lead in the title race. Arsenal never lost 1st place in the table for the rest of the season. In the UEFA Champions League quarter-final's 1st leg match against Chelsea, Pires managed to beat John Terry to a header, which resulted in the equaliser for Arsenal, after Eiður Guðjohnsen had given Chelsea the lead. However, Arsenal were eliminated after they lost 1–2 in the return leg, courtesy of an 87th minute Wayne Bridge goal. Pires also showed his playmaking skills in a goal against Tottenham Hotspur at White Hart Lane, in which Pires was the architect in building up the goal, and capped off the move with a goal to score Arsenal's 2nd goal of the game. Tottenham refused to give up, and managed to claw their way back and claimed a 2–2 draw. Despite that, Arsenal won the title after the match. Pires finished that season with an impressive tally of 14 goals and seven assists in the Premier League. He was Arsenal's second top scorer (behind Thierry Henry) and had the joint amount of assists (along with Dennis Bergkamp) that season. In the 2004–05 season, Pires finished third in the Premiership goalscorers table with 14 goals, behind teammate Thierry Henry and Crystal Palace's Andrew Johnson. Pires also picked up a second FA Cup winners' medal after Arsenal beat Manchester United on penalties. Pires was replaced by Edu in the 2nd half of extra time in that match. During the 2005–06 season, Pires started the season poorly, and players such as Freddie Ljungberg, José Antonio Reyes and Alexander Hleb were preferred to him on both wings. As the season progressed, though, Pires' form improved, outscoring his selection rivals overall mainly because of a bizarre penalty incident with Thierry Henry against Man City when Pires having scored from the spot earlier in the game tried passing it to Arsenal's star striker but Henry missed the ball and it went down as a penalty miss. 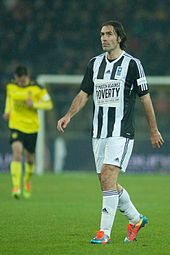 Pires was instrumental in Arsenal Quarter Final Champions League first leg against Juventus F.C., where Arsenal won 2–0. Pires successfully tackled Patrick Vieira and fed the ball to Thierry Henry who passed to Fàbregas to score Arsenal's first goal, the first time that Pires had gotten the better of Vieira. Pires played his last game for Arsenal in the UEFA Champions league final against Barcelona, in which he was substituted for replacement goalkeeper Manuel Almunia after starter Jens Lehmann was sent off. On 11 July 2008, Arsenal fans voted Pires as the club's sixth greatest player of all time. During the 2005–06 season, Pires wrangled with Arsenal over a new contract, in the hope of a new two-year deal. In keeping with the club's policy regarding players over 30, Pires was only offered a 12-month extension to his contract, which expired in June 2006. In May 2006, Pires agreed to an offer from Villarreal CF after a month of speculation, during which time he and Arsenal defeated Villarreal in the Champions League semi-final. One of the main reasons Pires gave for leaving Arsenal was that he felt he was no longer a first choice under manager Arsène Wenger. Pires was quoted saying: "I have to say I have had some disappointments this season. For instance, I was on the bench very often". Pires additionally suggested that Wenger's decision to withdraw him in the UEFA Champions League Final showed he had slipped in the eyes of his French boss. Pires said that he felt hurt by how Wenger did not trust him anymore, which was a major factor that convinced him that it was time to move on from Arsenal. On the official Arsenal matchday program for the game against Wigan Athletic on 11 February 2007, Pires revealed his heartbreak of being substituted so early on during the Champions League final. Pires stated: "I was very disappointed. When I saw my number on the fourth official’s board to be substituted, I couldn't believe it. It was my last game after six years at the club, a Champions League Final in front of all my family in Paris where I became World Cup champion and it lasted just 12 minutes. That was very hard to take". Pires was in fact substituted on 18 minutes for backup goalkeeper Manuel Almunia after goalkeeper Jens Lehmann who had received a straight red card. In May 2006, Pires agreed to join Spanish side Villarreal. He joined on a free transfer, subject to passing a medical, bringing to an end his six-year career as an Arsenal player. After Villarreal were eliminated in the semi-finals of the 2006 Champions League by Arsenal, Villarrael coach Manuel Pellegrini had wanted to sign Arsenal's Pires or Thierry Henry. Pires was officially unveiled as a Villarreal player on 3 July 2006. He scored his first goal for the club in 3–3 pre-season draw with Newcastle United on 5 August 2006. However, on 18 August 2006, Pires damaged the cruciate ligament in his left knee in a friendly match against Cádiz and required corrective surgery to alleviate the problem, which kept him out of action for seven months in his new club in Spanish top flight. Pires finally recovered from knee injury and made his first league appearance for Villarreal as a second-half substitute when he was named in Villarreal's squad to face Real Sociedad on 17 March 2007. Pires scored his first league goal on his return from injury in a 3–3 draw away to Real Betis on 31 March 2007. After three appearances as a substitute, Pires made his first start for Villarreal on 22 April 2007 against Barcelona. He opened the scoring for his team to defeat league leaders Barcelona 2–0, avenging his premature departure against Barcelona in the Champions League Final the previous May. On 13 May 2007, in a 4–1 win at Osasuna, Pires scored a seventh-minute opener as Villarreal continued their late-season push for a European spot. The run took Villarreal, at 11th spot without him in the side, to the brink of a UEFA Cup place in barely six weeks. Villarreal ended the season in 5th spot wherein Pires played crucial roles in helping Villarreal with the late charge up winning each of their final eight games and an entry into the UEFA Cup. The 2007–08 season was marked by the ongoing saga between Juan Román Riquelme and the board of Villarreal. Despite this distraction, Pires' leadership qualities helped Villarreal to win six of their opening eight games. Against Barcelona at El Madrigal, Pires' technique earned the Yellow Submarine two penalties which were duly converted by captain Marcos Senna. Villarreal ended up finishing second in La Liga behind Real Madrid, which was their best league finish in history, beating Barcelona into third place. In 2009, Pires faced former club Arsenal in the quarter-finals of the UEFA Champions League, coming on as a 70th-minute substitute in the first leg and playing the full 90 minutes at the Emirates Stadium. Villarreal were defeated 4–1 on aggregate, but Pires received a warm return from the Arsenal supporters, who sang his name throughout both legs. Pires was told in May 2010 that his contract would not be extended and he would have to look for a new club during the summer as Villarreal will be "changing their philosophy". Pires returned to England and trained at London Colney – Arsenal's training ground, in order to keep his fitness levels up. In October 2010, it was reported that Conference National club Crawley Town intended to talk to Pires about joining them for some part of the season, but the player's spokesman said they were "not aware of any interest" from that club. On 16 November 2010, Aston Villa boss Gérard Houllier had been in talks with representatives of Pires. On 18 November, the 37-year-old midfielder completed his move to Aston Villa on a six-month contract. He made his Villa début in the Premier League on 21 November as a second-half substitute, although his new club were beaten 2–0 by Blackburn Rovers. Pires' arrival at the club was praised by many of Villa's senior players, including Gabriel Agbonlahor, Stewart Downing and Shane Lowry. Pires scored his first goal for Aston Villa in the 3–1 FA Cup win against Blackburn Rovers on 29 January 2011. His next start was also against Blackburn Rovers in the Premier League on 26 February. His performance in Villa's 4–1 win was described by Sky Sports as "his most influential" since joining the club. In early March, Pires announced that he would like to remain at Aston Villa for the 2011–12 season. Villa boss Gérard Houllier responded positively to this claim, but admitted that no decision would be made until the Summer of 2011. However, he was released by the club on 27 May 2011 after the 2010–11 season finished. In September 2011, Pires made a guest appearance for Scottish Premier League side Hibernian in Ian Murray's Testimonial match at Easter Road. In September 2013, Pires made a guest appearance for Premier League Aston Villa in Stiliyan Petrov's Testimonial match at Celtic Park. On 25 July 2014, Pires announced a comeback to promote the launch of the Indian Super League. On 2 September 2014, he was signed by Goa, becoming their marquee signing. The 40-year-old came out of retirement to play for Goa, one of eight teams in the newly created league. "For me the project and the passion for the game are very important. India needs a start. You need to progress. And for me, that was important. I had offers from the USA and Qatar but I wanted to be part of a new beginning for the sport in India. As for the conditions, we all know about them – but I'm ready and training hard. I like the pressure," he said. Pires is a regular at Arsenal's training ground, using the facilities to stay fit, and said that he spoke to Arsène Wenger about playing in India: "He told me if you have it in you and if you have the passion to go play in India, then do it. And I think I'm ready." "The reception at the airport was amazing," he said, on his unveiling in India, before adding, "Thank you for the welcome India... and the spicy food." Pires made his league debut for Goa on 15 October 2014, a 1–2 defeat to Chennaiyin FC. On 25 October 2014, he was given a two-match ban for insulting Atlético de Kolkata's manager Antonio López Habas. He scored his first league goal on 13 November 2014 in a 4–1 away win over Delhi Dynamos. Pires was released by FC Goa on 13 March 2015. On 25 February 2016, Pires announced his retirement from professional football. Pires expressed interest in and was approached by Arsene Wenger with regard to coaching. As of 2016, Pires has commenced a career as a footballing coach with the first team at Arsenal. Pires was part of France's 1998 World Cup and Euro 2000 winning squads, but had to miss the 2002 World Cup due to an injury he sustained playing for Arsenal. He also played in 1996 Olympic Games and Euro 2004. However, a dispute in late 2004 with French national coach Raymond Domenech put a halt to Pires' international career. He won 79 caps for his country and scored 14 goals. He won the Golden Ball (for most outstanding football) and Golden Shoe (for most goals scored) awards at the 2001 Confederations Cup in Korea/Japan. Pires provided two golden goal assists during his international career, first setting up Laurent Blanc against Paraguay in the 1998 World Cup round of 16 and providing David Trézéguet with the match-winning ball in the Euro 2000 final. The former was the first Golden Goal ever scored at a FIFA World Cup. In 1992, during his initial year at FC Metz, Pires met his first wife, Nathalie. The two were married for six years and divorced in 2003. Pires told The Daily Mirror that his divorce ruined him and affected him professionally, interfering with his concentration and sleep. He also blamed it for his odd behavior, such as publicly fighting with French coach Raymond Domenech in early 2004. Shortly after the split from Nathalie, Pires met French model Jessica Lemarie through mutual friends. On 10 August 2005, she gave birth to the couple's first child, Naia. Since then, Lemarie and Pires have married and had a son named Theo, born 11 July 2007. On 17 January 2012, Pires became an ambassador for Grassroot Soccer, an international non-profit that uses the power of football to educate, inspire, and mobilize communities to stop the spread of HIV. ^ "Robert Pires". Barry Hugman's Footballers. Retrieved 14 October 2018. ^ "Robert Pires". ESPN FC. Retrieved 14 October 2018. ^ a b c "Jeff Reine Adelaide reveals he is learning from Arsenal legend Robert Pires". Metro. UK. ^ a b c d Kimmage, Paul (27 October 2002). "Robert Pires the laughing cavalier". The Times. London. Retrieved 22 May 2010. ^ "Mrs Pires happy with her rain man". ESPN. 20 November 2001. Archived from the original on 22 June 2011. Retrieved 4 October 2010. ^ "Pires sends Arsenal through". BBC Sport. 17 October 2000. Retrieved 20 September 2009. ^ "Arsenal sink rivals Spurs". BBC Sport. 8 April 2001. Retrieved 20 September 2009. ^ "Arsenal Statistics 2001/02". KickOff.co.uk. Archived from the original on 1 November 2013. Retrieved 30 October 2013. ^ "Arsenal Statistics 2003/03". Kick Off.co.uk. Archived from the original on 1 November 2013. Retrieved 30 October 2013. ^ "Pires fires Arsenal to FA Cup glory". Daily Mail. London. ^ 3 mins 25 seconds (11 July 2008). "Gunners' Greatest Players – 6. Robert Pires". Arsenal F.C. Archived from the original on 4 August 2011. Retrieved 4 October 2010. ^ "Pires agrees deal with Villarreal". BBC Sport. 25 May 2006. ^ "Hope for Henry". Sky Sports. ^ "Pires agrees contract with Villarreal". Daily Mail. London. 25 May 2006. ^ a b "Pires set to leave Villarreal". FourFourTwo. 7 May 2010. Retrieved 4 October 2010. ^ "Arsenal legend training at London Colney". Arsenal F.C. 24 April 2010. Archived from the original on 6 October 2010. Retrieved 4 October 2010. ^ "Robert Pires 'not aware' of Crawley Town interest". BBC Sport. 21 October 2010. Retrieved 21 October 2010. ^ "McAllister welcomes imminent arrival of experienced midfield ace Pires". Aston Villa Football Club. 16 November 2010. Archived from the original on 17 November 2010. Retrieved 16 November 2010. ^ "Robert Pires completes move to Aston Villa". BBC Sport. 18 November 2010. Retrieved 18 November 2010. ^ "Lowry: Lining up alongside class act Pires was surreal". Aston Villa F.C. Archived from the original on 27 December 2010. Retrieved 2 February 2011. ^ "Agbonlahor thrilled to line-up with Pires in claret and blue". Aston Villa F.C. Archived from the original on 29 December 2010. Retrieved 2 February 2011. ^ "Downing joins Pires praise". Sky Sports. 25 November 2010. Retrieved 2 February 2011. ^ "Villa sink wretched Rovers". Sky Sports. 26 February 2011. Archived from the original on 27 February 2011. ^ "Pires wants Villa stay". Sky Sports. 1 March 2011. ^ "Pires targets extended stay after revealing he is loving life at Villa". Aston Villa F.C. 1 March 2011. Archived from the original on 4 March 2011. ^ "Houllier plans Pires talks". Sky Sports. 1 March 2011. ^ "Farewell to Reo-Coker and Carew as released list announced". Aston Villa F.C. 27 May 2011. Archived from the original on 27 May 2011. Retrieved 27 May 2011. ^ "Ian Murray Testimonial 2011–12". Archived from the original on 3 July 2012. Retrieved 7 December 2012. ^ "Freddie Ljungberg agrees deal to promote Indian Super League". Daily Mail.co.uk. ^ "Mumbai, Goa to settle for Arsenal legends". The Times of India. Retrieved 2 September 2014. ^ "Why Robert Pires chose India's ISL over America's glitz and Qatar's riches". First Post.com. 24 September 2014. ^ Raj, Rohan (15 October 2014). "ISL: Record-breaking Chennaiyin FC romp to 2–1 win over FC Goa". India Today. Retrieved 15 October 2014. ^ "ISL announces ruling on incidents from FC Goa vs Atlético de Kolkata fixture". Indian Super League. Retrieved 25 October 2014. ^ "Goa romp into 4–1 lead against Delhi Dynamos". Firstpost. Press Trust of India. 13 November 2014. Retrieved 13 November 2014. ^ Mergulhao, Marcus (14 March 2015). "FC Goa drop all four strikers". The Times of India. Retrieved 13 July 2015. ^ "Former Arsenal and France midfielder Robert Pires retires from football". The Guardian. 25 February 2016. Retrieved 25 February 2016. ^ "Robert Pires Arsene Wenger said that i could coach at Arsenal". Squawka.com. ^ "Robert Pires; Free Kick Master". Freekickmastersusa.com. Archived from the original on 8 August 2010. Retrieved 4 October 2010. ^ "International soccer star joins grassroot soccer as ambassador". Grassroot Soccer.org. ^ "Robert Pirès". National Football Teams. Benjamin Strack-Zimmerman. Retrieved 4 October 2010. ^ a b c d "R. Pirès: Soccerway". Soccerway. Perform Group. Retrieved 14 October 2018. ^ a b "Robert Pires: Overview". Premier League. Retrieved 17 April 2018. ^ "Robert Pires". Arsenal F.C. Archived from the original on 14 January 2015. Retrieved 29 September 2014. ^ a b "Palmarès Trophées UNFP – Oscars du foot". Sport Palmares.eu (in French). ^ "Robert Pires of Arsenal with the Football Writers Player of the Year Award". Getty Images.com. ^ Hugman, Barry J., ed. (2002). The PFA Footballers' Who's Who 2002/2003. Queen Anne Press. p. 480. ISBN 1-85291-648-6. ^ Hugman, Barry J., ed. (2003). The PFA Footballers' Who's Who 2003/2004. Queen Anne Press. p. 496. ISBN 1-85291-651-6. ^ Hugman, Barry J., ed. (2004). The PFA Footballers' Who's Who 2004/2005. Queen Anne Press. p. 480. ISBN 1-85291-660-5. ^ "2001/02 Season Review". Premier League. Retrieved 5 December 2018. ^ a b "FIFA Confederations Cup Korea/Japan 2001 | Awards". FIFA. Retrieved 20 October 2017. ^ "Pele's list of the greatest". BBC Sport. 4 March 2004. Retrieved 29 September 2014. Wikimedia Commons has media related to Robert Pirès. This page was last edited on 6 April 2019, at 15:16 (UTC).